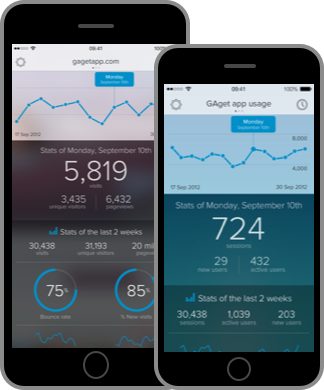 GAget gives you a quick glance at your metrics & notifies you of the changes that are important to you. “When you only want the highlights, GAget is better than Google Analytics. GAget for iOS is featured in the App Store by Apple in “The influencer's toolkit“ story. “GAget does a fantastic job of removing the complexity from Google Analytics, and presents only the relevant data to you. “The amount of data displayed is just what you need to feel on top of your website & app analytics! GAget displays the most important information from Google Analytics, so you can focus on your work instead of digging through a website. For a quick glance at the most important stats for the today, 1/2/4 weeks. See what’s happening in real-time. 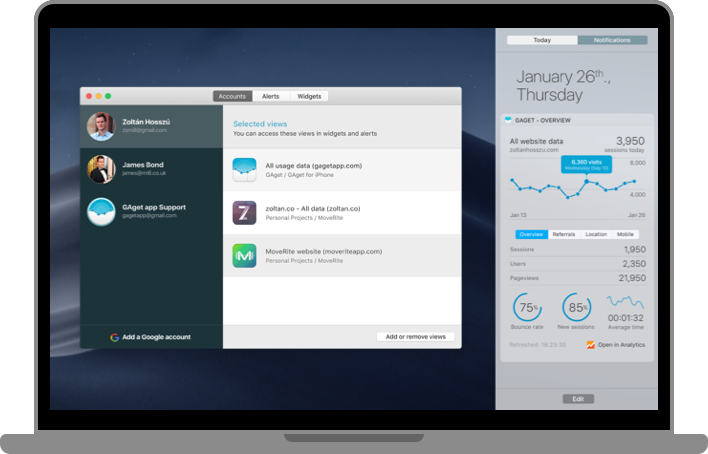 Displays top locations with a map, devices and active pages. Set metrics goals and get notified when your website or app reaches them. Log in with all of your Google accounts to access every Analytics view shared with you. Touch the beautiful stats of your website in an easy-to-use and attractive app. Get to know where your users are coming from and what devices they are using. See what social channels work for your sites the best. More features are coming later this year with a brand new version of GAget for iOS.